Pumpkin bread is a quick batter bread, made without yeast, relying upon baking soda and baking powder combined with the acidity of pumpkin to make it rise. 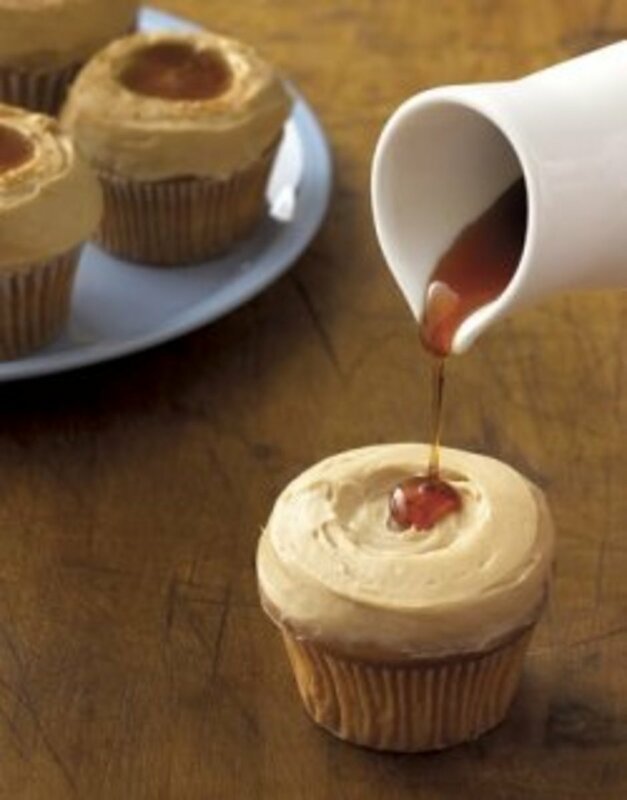 This recipe comes from a family recipe book with Indiana origins. 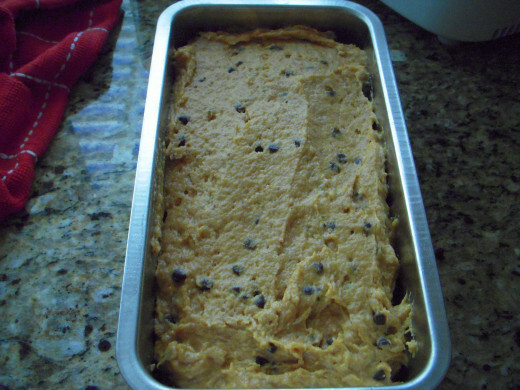 It makes one loaf of pumpkin chocolate chip bread.The resulting loaf is dense-yet-light, moist, and very flavorful. Spicy pumpkin bread enhanced with rich cocolate chips make a winning combination, but there are some techniques that will help you bake the best, most flavorful pumpkin chocolate chip loaf possible. If you haven't used your cinnamon in over a year, it might be time to replace it. Check you spice bottles for "good until" dates. If you're like many busy people, your kitchen spices may be well past their expiration dates. 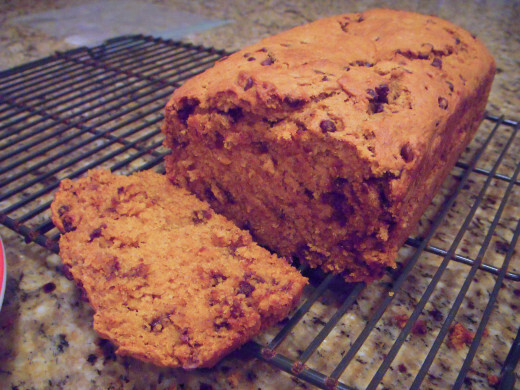 Pumpkin chocolate chip bread relies upon fresh spices for best flavor, so be sure to check your spices! Although you can make your own mashed pumpkin from scratch, canned pumpkin has its advantages. Canned pumpkin is consistent in flavor and convenient. Most grocery stores carry canned pumpkin year-round. You can even find organic canned pumpkin if you prefer it. I prefer Libby's 100% Pure Pumpkin in the 15 ounce can, or Trader Joe's Organic Pumpkin, also in a 15 ounce can. But even canned pumpkin can be improved upon, and it only takes a few extra minutes of prep time to bring out the best flavor possible.The idea is to remove some of the excess water in the canned pumpkin. To prepare, line a colander or large mesh strainer with 2 paper towels. Empty the canned pumpkin into the lined colander and place over a plate or bowl. Allow some of the water to drain from the pumpkin for about 10 minutes. 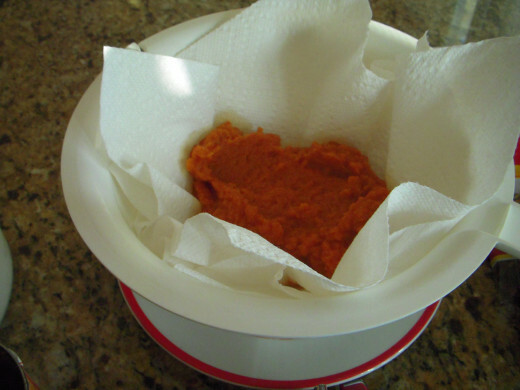 When you are ready to use the pumpkin, turn the strainer over a clean bowl and empty out the pumpkin into the bowl. The paper towels should lift cleanly away, but if not, simply scrape the pumpkin off the paper towel using a spatula. When making a quick batter bread, it's important to use the right sized chocolate chips. For pumpkin bread, use mini chocolate chips, which are small and light enough to remain suspended in the batter while baking. 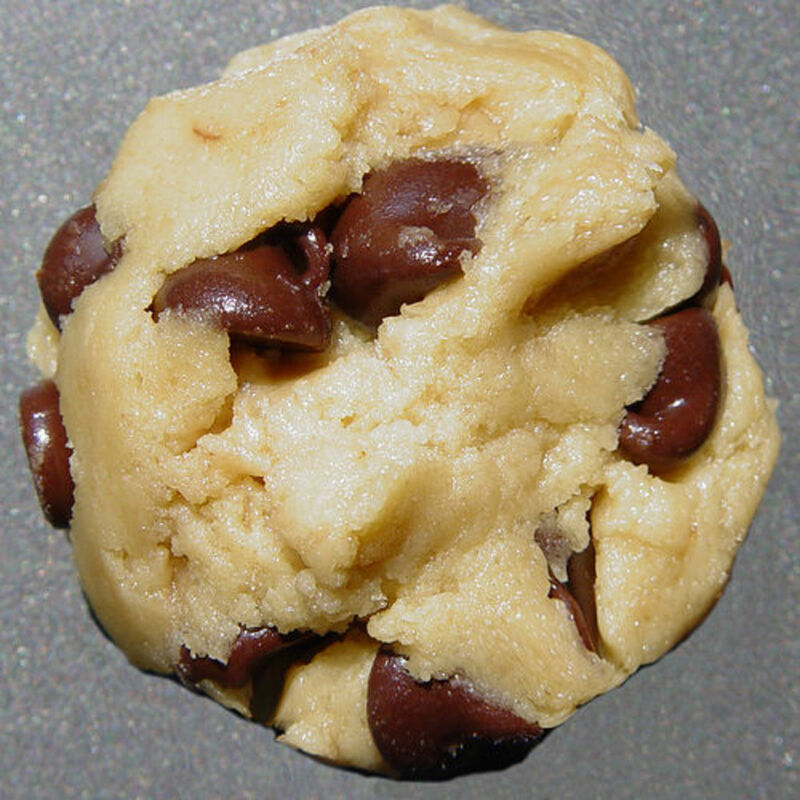 If you use regular sized or oversized chocolate chips, they will sink to the bottom of the pan during baking. Preheat oven to 350 degrees. Spray 9"x5" loaf pan with cooking spray. Line large colander or strainer with 2 sheets paper towel and empty can of mashed pumpkin into it. Let drain for about 5- 10 minutes while you prepare dry ingredients. 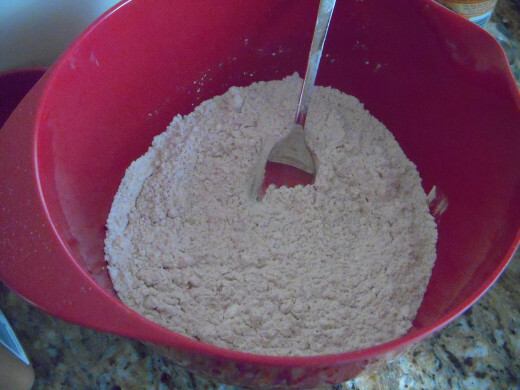 Stir flour with fork to lighten it, then measure into measuring cup. 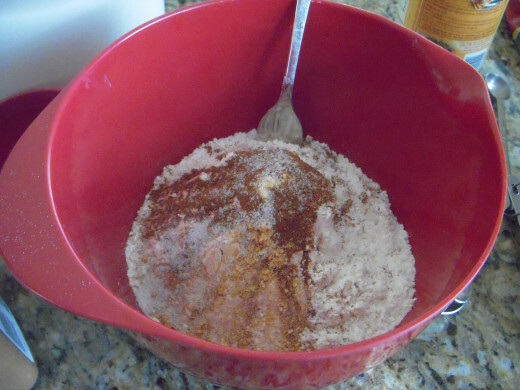 In a separate bowl, combine flour, baking soda, baking powder, salt and spices (cinnamon, nutmeg, ginger, and cloves if using it.) Set aside. This will be your "dry ingredients" bowl. 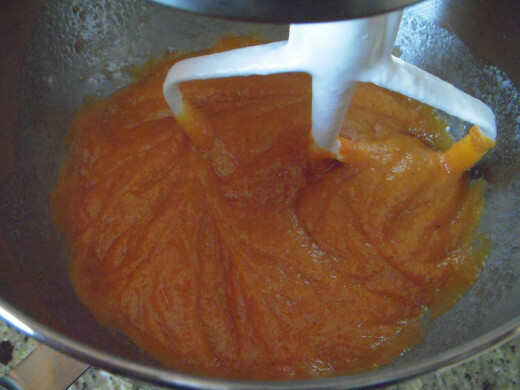 Remove pumpkin from strainer (remove paper towels) and put pumpkin into large mixing bowl. 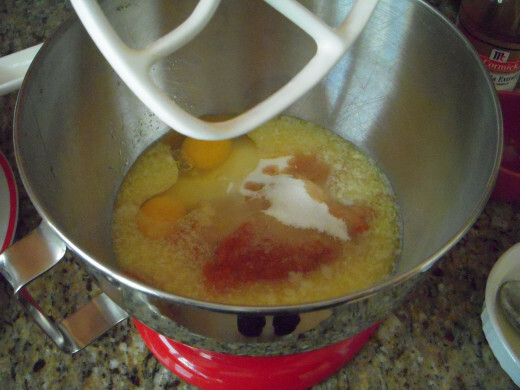 Add sugar, eggs, melted butter and vanilla extract. Mix well. 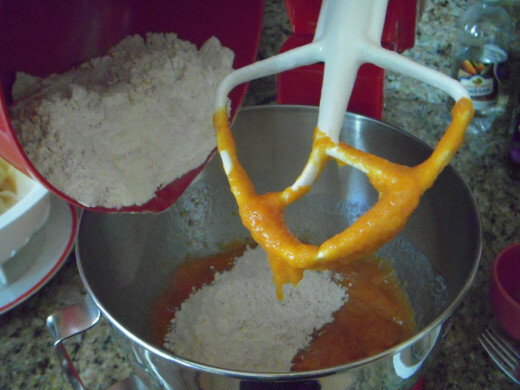 Add dry ingredients to pumpkin mixture all at once and mix just until combined. Take care not to overmix. Batter will be thick but not stiff. Lightly fold in mini chocolate chips using a spatula. 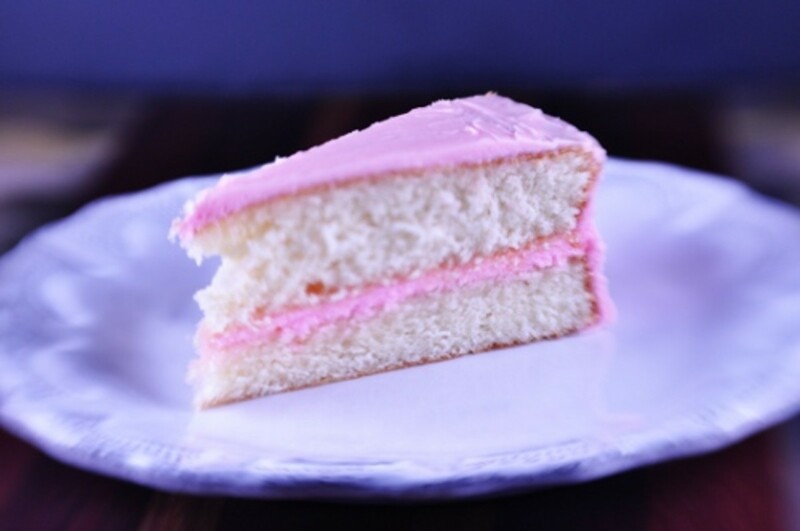 Spread batter evenly into a greased 9"x5" loaf pan and bake in 350 degree oven until knife or cake tester inserted into center of loaf comes out clean, about 45-50 minutes. 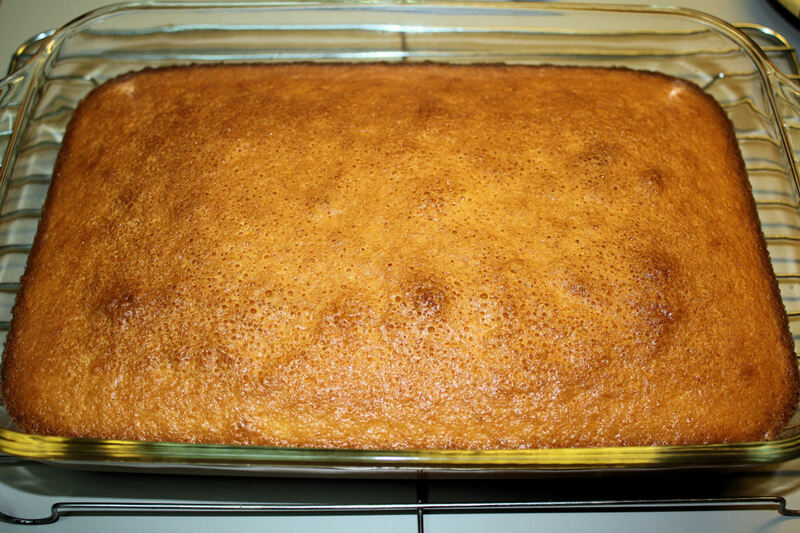 Cool in pan for 10-15 minutes and then turn out onto cooling rack. Cool completely before cutting. i love pumpkin bread especially with choc chips. You had written a good hub. So detail and easy to follow. Voted up. 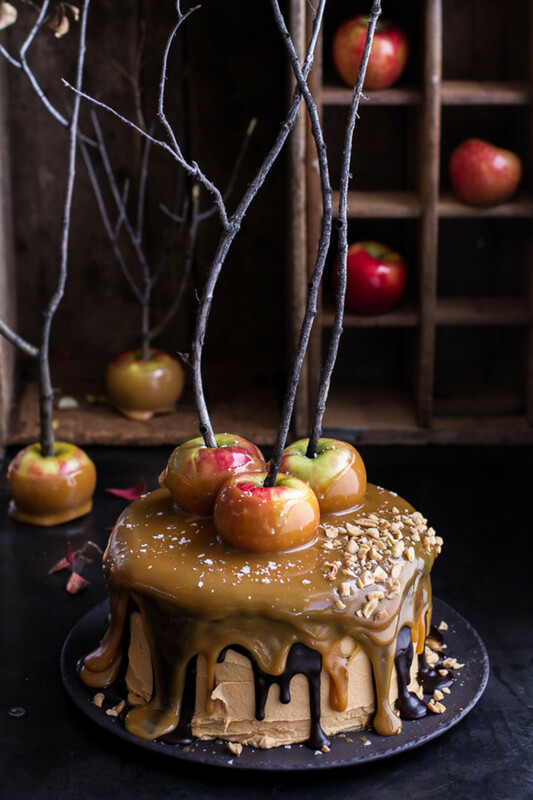 Is there a yummy vote?